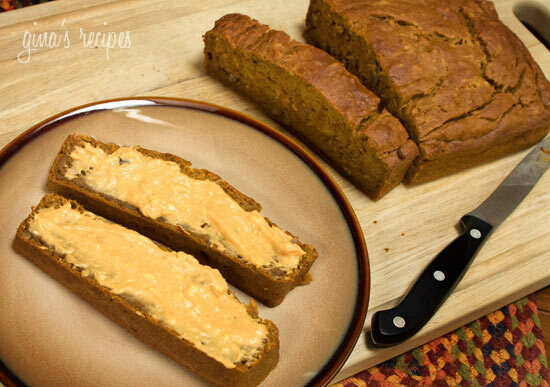 This Fall pumpkin banana bread is basically my Banana Nut Bread recipe which is a deliciously moist bread and I improvised it with the pumpkin and spices. This came out super moist and we had a difficult time waiting for it to cool because it smelled so good! We scoffed up half this bread before I got a chance to photograph it. This was wonderful topped with some Pumpkin Spiced Cream Cheese! I also have a Pumpkin Bread with Pepitas (Seeds) and Pumpkin Nut Muffins. Baking is a science and remaking cakes and breads to make them healthier is not always as easy as say remaking a pot of soup or a casserole. So whenever I am experimenting with baking, my fingers are crossed the whole time. Grease a 9×5 inch loaf pan with baking spray. 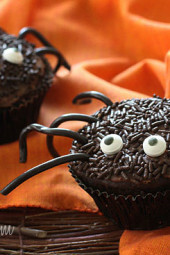 In a medium bowl, combine flour, baking soda, pumpkin spice and salt with a wire whisk. Set aside. Add egg whites, egg, bananas, pumpkin and vanilla, and beat at medium speed until thick. Add flour mixture and nuts (if using), then blend at low speed until combined. Do not over mix. Pour batter into loaf pan and bake on the center rack for 60 minutes, or until a toothpick inserted in the center comes out clean. * 1 tsp of pumpkin spice can be substituted for cloves and nutmeg. Made this for the first time today and it is delicious!! I made it into 12 muffins, so that it was easier to share and also baked a lot quicker (20 minutes). I also mixed in some mini chocolate chips and sprinkled a few on top before baking, and this added just a bit of sweetness that balanced perfectly with the spices! I made this recipe for the first time today. The bread was good but it tasted a little to gummy inside. Not sure if that is the way it’s suppose to be. I made this tonight. Made 4 small loaves, added chocolate chips to 2 and raisins to the other 2. Tasted great! I made this tonight. It is absolutely delicious! Made 4 small loaves, added chocolate chips in 2 and raisins in 2. Tastes great! This is excellent bread! I made it this morning with my kids and it is delicious! Will make again soon! What would be a good way to incorporate zucchini into this recipe? I have been looking for a healthy zucchini pumpkin recipe! I only have two bananas left.. 🙁 Could I use more pumpkin puree in place of my missing banana? So i just cooked this tonight and it did not turn out like it was suppose to. I had to cook this an extra 30 minutes and it still was not cooked all the way through. Soooo gooood!!!!! Love it!!! Moist and tasty!!!! What is the difference between pumpkin puree and canned pumpkin. So good. I just made these last night. The only sub I made was quick oats for the whole wheat flour. The texture was perfect. I made it in muffin form so I can control myself 🙂 Great recipe Gina!! Could I use a combination of white whole wheat and 100% whole wheat pastry flour? I made these into muffins and they were delicious! I shared it on my blog with credits to you. Thank you for a yummy recipe! Do you think it would be possible to substitute the butter for applesauce? And if so, how much? 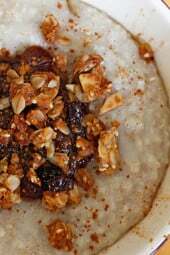 I've used this recipe for a few years and it does come out perfect – just curious if I can cut down on the fat. By far the best skinny version of a banana bread!! I've made this twice now. The first time as a loaf and made the pumpkin cream cheese to go with it. The second time I made 12 muffins instead. I still followed the recipe as is except I cooked them for 30 minutes. That seemed to be just the right amount of time. They still turned out moist and delicious!! Love these for breakfast or dessert! Made this and it did not rise much and came out "gummy". Could it be because I used whole wheat pastry flour and not whole wheat white flour? The first time I made it the bottom seemed that way a little bit and I used the whole wheat white flour. I think it is just because of all of the "wet" ingredients. I used very, very ripe bananas the first time and that seemed to add to that. The second time when I did muffins and used less ripe bananas, I didn't have that problem. Hey Gina, I noticed you made points clarifications for with/without nuts but is the nutritional value (calories, fat etc) with or without the nuts? I'm leaving them out. Made this last night with the Splenda brown sugar blend, the conversion is on the back of the package so no guesswork involved and it came out amazing! I am enjoying a nice slice with a delicious pear that my beautiful friend sent me from Harry and David for my birthday! What a great way to start my day !!!! Just made these! Yum! I made muffins instead of a loaf because I don't have much self control when it comes to delicious food. Muffins make it easier for me to stop myself! 😉 I only had two very ripe bananas and they still came out delicious. I just pulled these out of the oven. I made them into 12 muffins and added 1 tablespoon of chia seeds. Otherwise followed your recipe exactly. Super yummy! Thanks for the healthy recipe. I have a pumpkin bread recipe that I love but it's not so healthy. 🙂 More like cake! Here's the link if you ever want to give it a try. It's great plain or with cream cheese frosting. 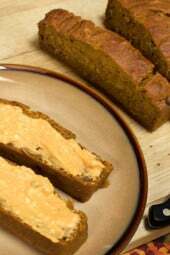 http://stefanieskitchen.blogspot.com/2008/12/spiced-pumpkin-bread.html I'll use yours when I want healthy though! Made this today and it was SO DELICIOUS!! I only had one (very, very large) ripe banana so I used that and cut the rest of the recipe in half. I also used a donut pan and it made 6 perfect sized donuts! Love all your recipes! I made this today and it was the BEST banana bread I have ever tried in my life. I used one banana because it was the only thing on hand and I added a few tbsps of skim milk for a bit more moisture.I even threw in some mini chocolate chips for a nice twist. It was AMAZING!!!! I will be making this again soon!!! Just made this. Tasted more like banana bread, however, it was delicious. Question – when were we supposed to put cinnamon in? I just made this. The flavor is wonderful, but the texture is gummy. I followed the recipe exactly. The directions mention "egg whites" (plural), but the ingredients list says "1 egg white." Is it supposed to be gummy? It's nothing like bread–or cake. No gumminess when you make muffins instead. I made this just this afternoon and it's delicious! I do want to also try the pumpkin spice cream cheese to go with it. I have a Ladies Meeting at Church on Saturday and I plan on making another loaf along with the cream cheese to take as a snack for the Ladies. Again, Thanks Gina for a fabulous recipe! Gina, I totally forgot to add the cinnamon… :/ resulting in a dominating flavor of ground cloves and nutmeg. Where do you suggest I add cinnamon next time? In the flour mixture? this website makes my husband and coworkers into believers of eating healthy and having the food taste awesome! made one pan last night, but i seriously think that it will not be enough so made another one this morning! I just made this bread today, using regular flour instead of bleached flour and it came out so moist and perfect. Amazing beginner recipe! Such a yummy, flexible recipe. The first time I made these I used 2 whole eggs and added chocolate chips and baked in 4 mini cake pans for about 32 minutes… they could've used a few more minutes baking but otherwise were delicious! Today I made a double batch, using 4 extra large bananas and all whole eggs. I didn't have cloves so I doubled the nutmeg instead. I also accidentally used baking powder instead of baking soda, so they didn't rise as much but they taste great. With the double batch I made 12 full-sized muffins (baked for 25 minutes) and 4 mini loaves (baked for 35 minutes). I've made the bread 3 times this season already and I'm making them as muffins right now, thank you so much for the recipe. Truly one of the best pumpkin breads I've ever tasted, light or not. Honestly, the BEST Pumpkin Bread I have ever tasted! The bananas make it so moist! I am definitely sharing this! Thanks! Just pulled these out of the oven and have already eaten 2 (with help from my 4 year old!) These are soooooo moist! A really nice blend of banana and pumpkin flavors! I made this tonight and it is DIVINE!!! Great recipe! Nice to have with coffee too! Why the Use of 2 different flours? I made this last night. The house smelled so good while it was baking. I wasn't sure how moist the bread was going to be with just 2T of butter, even though the pumpkin was added. Let me say, it came out PERFECT. Just the right blend of banana and pumpkin spice. Very moist, lovely loaf. 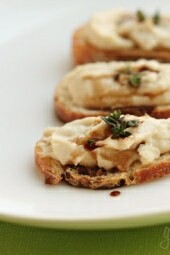 Thanks Gina once again for a wonderful recipe that I will make over and over! Hi gina i dont have any unbleach flour could i used regular flour, also can i used whole wheat pastry flour? I made muffins tonight and they are fabulous. I subbed quick cooking oats for 1/2 of the flour (equal substitution) and used a bit more banana and pumpkin to add a bit of extra moisture. Turned out great! Thanks for all of the great recipes, Gina. I recently lost over 30 pounds on Weight Watchers and credit much of the success to your site. I love sharing your recipes with others! I just made this and it is sooo good! Of course, I haven't made one of your recipes yet that wasn't! Be warned though, it is very hard to stop at one slice!!! It was a hit with my husband and kids too. I just made it and oh my goodness does it have our townhome smelling DELISH!!!!! I substituted egg beaters/egg whites for the real deal and used splenda brown sugar instead the real brown sugar….thinking about making these as "treats" for our wedding guests to welcome them at the B&B where we're getting married in November…excellent recipe!!!! Made it this afternoon! It was delicious after dinner! I found this on Pinterest the other day and am so glad I did. I am in love with this bread. It is so moist and delicious. I have to make another loaf this weekend because my first loaf is all gone! Thank you! Made this the other night and it didn't rise at all. It came out of the pan the same height as it was when I poured it in. Should I add more baking soda or is it supposed to be like this? This is the best banana bread I have ever made! It was so moist and flavorful. Thanks for another great recipe!